An elder walks pass the voting sign placed on the fence at one of the public schools in Lowell, Massachusetts, Thursday, September 8, 2016. For the 29 years that Pheng Ang has called Lowell home, he hasn't seen the local Cambodian-American community, the second largest in the U.S., as politically fragmented as it is today. With the U.S. presidential election just weeks away, however, the rift has nothing to do with Democrats or Republicans. It's the roiling feud between political camps nearly 13,000 kilometers away that's taking a toll on locals. 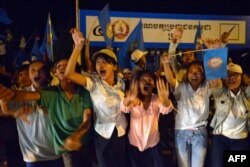 FILE - Supporters of the Cambodian People's Party (CPP) shout slogans during a general election campaign in Kandal province, July 12, 2013. Pheng, who escaped the war-torn Southeast Asian country in 1987, has always been aware of the long shadow its domestic politics cast over life in Massachusetts. But ever since a visit earlier this year by Hun Manet, son of long-time Cambodian Prime Minister Hun Sen, divisions have only deepened. It was on that one day in April that Manet, a senior military figure and heir-apparent to a polarizing regime in Phnom Penh, was greeted by angry protesters accusing him of violating human rights and repressing the political will of the opposition Cambodian National Rescue Party (CNRP). FILE - Members of the opposition Cambodia National Rescue Party raise joined hands for photographs at their party headquarters in Phnom Penh, May 27, 2016. In the 1980s, large numbers of Cambodian refugees began arriving in the northeastern state of Massachusetts — predominately in the city of Lowell — as war gripped the tiny kingdom, which was still shaking off atrocities of the genocidal Khmer Rouge. Rithy Uong, the first Cambodian elected to Lowell's nine-member city council, says the 30,000-strong Cambodian-American community was caring and unified when he arrived in the '80s. Imported political divisions have had consequences for municipal elections, he added, explaining that Lowell's ethnic Cambodian voting bloc is so fragmented that its voice in city hall has been diluted. Currently, there are no Cambodian councilors. While Cambodian-American Veasna Nuon was elected to the city council in 2011, he held the position for only a single two-year term; he and three other Cambodian-American candidates were all unsuccessful in last year's election. 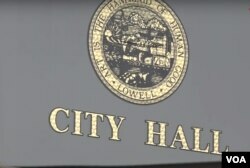 Nine members of the city councilors are overseeing the City Hall of Lowell, Massachusetts. Two other Cambodian-Americans, Kamara Kay and Dominik Hok Y Lay, ran unsuccessfully last year for seats on Lowell’s school committee. The first generation of Cambodians who migrated to Lowell more than three decades ago focused on building better lives for themselves individually, so politics typically wasn't high on the agenda. But Cambodia's domestic politics eventually followed them here, working its way into local religious institutions, triggering a political segregation of Buddhist temples, physical division of community centers, and the organization of local leadership roles according to homeland political allegiances. Newly arriving Cambodian immigrants, residents say, continue to arrive with long-held political convictions intact. While some prominent Cambodian-Americans such as Sovann Ou, Phnom Penh's honorary consul general in Lowell, declined to comment for this article, others openly speculated about how to heal the rift. “Most of the CPP members I know live here [and] also have families here, and they regard this city as their home, too," said Tolayuth Ok, a representative of the ruling CPP’s youth movement in Lowell. On the other side of the political divide, Sok Paul Pen, president of the U.S.-based CNRP youth movement, says it's time for stakeholders in the Cambodian-American community, especially the non-political Cambodian Mutual Assistance Association (CMAA), to take a leading role in reuniting the “fractured" diaspora. Sok Paul Pen, president of the U.S.-based CNRP youth movement in Lowell, Massachusetts. “I would like to appeal to the CMAA that they have to think of [the issue] and step into the political sphere to solve this,” he said. That, however, seems unlikely to happen. CMAA Executive Director Sovanna Pouv says his association’s mission was focused on Cambodians in Lowell, not politics in Cambodia or its local manifestation. “If we focus a lot on what is happening in [Cambodia], which we have high respect for, and we respect everyone that is connected to the country, it pulls away from our true work here” in the U.S., he said. Another community leader, Sidney Liang, compares Lowell's politically charged environment to a passing storm. “Outsiders may think that the people in Lowell must be divided when they saw a protest taking place here, but in fact that’s not true,” he said, echoing the opinion of Rady Mom, the Cambodian-born State Representative for the 18th Middlesex district in Massachusetts, who frequently downplays talk of a fragmented community. “If we often mention the fracture or division, that’s not correct. We should get rid of that term,” said Rady, who is currently seeking a second term. “If you just look at our pagodas we built, those came from our unity,” he said, referring to the construction of two separate pagodas in Lowell. Their concurrent construction didn't reflect a divided community, he said, but one that's rapidly expanding. Political parties and their respective support bases need to focus on mutually beneficial debates rather than destructive political diatribes, said Tararith Kho, a former Harvard fellow and current Khmer literature lecturer at Lowell Community College.